It was an unorthodox and often wild naval war, that of the rebellion. The Civil War was waged at sea with more massed violence and with more diversity of ships and weaponry than any previous, sustained naval action. It was pressed with at least the same vigor and passion as on land, and with considerably more improvisation. Ferryboats were turned by edict into men-o'-war. China and upholstered furniture were trundled off ocean liners as they were converted into warships. To compensate for a lack of naval guns, army field pieces were snatched from forts and wheeled onto tarred deckings, then lashed down. Iron or tin plating was nailed onto wooden steamships to make them "ironclads" or "tinclads." Still, they took their knocks from Confederate shore batteries and from ingenious mines (or "torpedoes"), since they were not armored below water line. A revolutionary little gunboat flush with the water and sporting but one turret would prove a nemesis for the ponderous Confederate ironclads, whose very avoirdupois damned their maneuverability. At the same time, the noble wooden frigate with multiple banks of cannon met extinction. The Confederates, not to be outdone, went into battle with "cottonclads" in addition to ironclads, but the former proved as susceptible to fire as dry tinder. The South pioneered in "torpedoes," including some sophisticated models detonated electrically. With few exceptions, the Civil War's naval actions were fought within sight of the coasts, in bays, or upon the wide rivers, especially the Mississippi. Although fleet or squadron operations continued an historic role, the daring of the individual still possessed the potential to destroy a Goliath. Stealth, deception, and hoax were employed alongside conventional military confrontation. On occasion, the army's prerogatives became interchangeable with the navy's. Soldiers attacked ships. Sailors raided shore targets. Army officers even had the impertinence to command vessels. And in one coastal city--Portland, Maine--the citizenry mobilized with muskets to repel a one-man invasion from the sea. Although, in retrospect, certain operations might appear to have been curious kinds of games, the participants, to paraphrase an old proverb, "died in earnest." These shadings, as well as the bold strokes in the War of the Rebellion, the War Between the States, or whatever the Civil War is to be called, make up the canvas of this book. 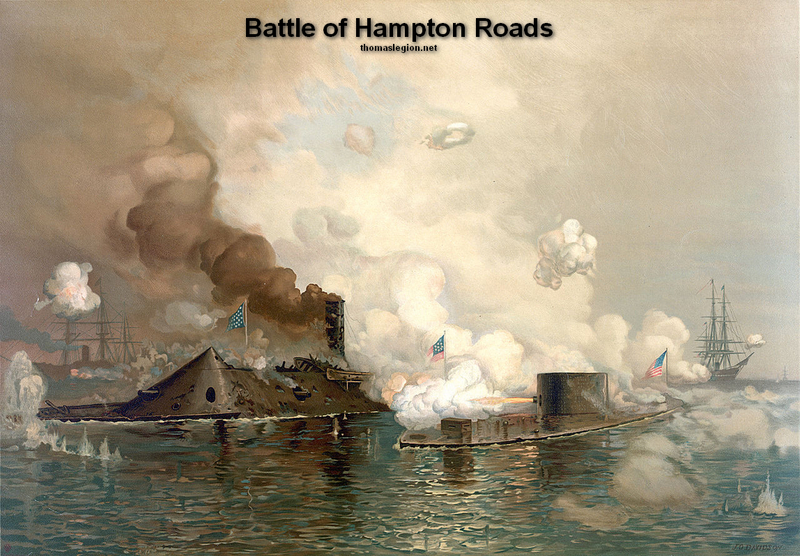 Too often, the naval role has been overshadowed by the scope and casualties of the land battles from Bull Run (or First Manassas) to Cold Harbor and the fall of Richmond. Yet the struggle was carried forth with undiminished ferocity at sea and upon the waterways, and with equal effectiveness. North and South alike exerted immense efforts to control the paths of trade and communication. The outcome would materially effect the conflict's final curtain. Confrontation on the seas was heralded on April 15, 1861, when President Lincoln declared a blockade of the ports from South Carolina to the Gulf of Mexico. The blockade was soon extended northward to include all of Virginia. "For this purpose," Lincoln stated, "a competent force will be posted so as to prevent entrance and exit of vessels" under pain of capture. Further, any attempt to interfere would be "held amenable to the laws of the United States for the prevention and punishment of piracy." In so doing, the president was invoking one of history's oldest stratagems of warfare: starving the enemy into submission. "A paper blockade!" howled the secessionists, and at the time it truly was. Foreign nations joined the chorus, especially Great Britain, which was experiencing nightmares about feeding her cotton mills. She needed to keep cargo ships-sail or steam-running to Wilmington, North Carolina; Charleston, South Carolina; Savannah, Georgia; Pensacola, Florida; New Orleans, Louisiana- Galveston, Texas; and even Matamoros, Mexico. The United States Navy was manifestly unprepared. Easily half of the ninety vessels listed in the 1861 Naval Register either were unfit for sea or were languishing in shipyards while awaiting decommission. Also, some twenty-eight of the so-called active showed the flag off foreign shores. Half a dozen of these lazed at anchor on the popular China station, their crews ashore on historic personal quests. Left were a meager fourteen, at most, to defend the East Coast and to blockade Dixie. "After the inauguration of Mr. Lincoln as President," wrote Rear Admiral Daniel Ammen, "a painfull lethargy seemed to pervade every, branch of the Administration, while the South was arming and organizing with extraordinary activity for the avowed purpose of destroying the Government, which apparently supinely awaited that event." There appeared but one approach. It entailed the arming of almost anything afloat of reasonable size, including ocean steamers, ferryboats, fishing smacks, river sidewheelers, private yachts, harbor tugs, and barnacled old schooners. If the craft happened to be steam-propelled, that was a plus. Otherwise, if the vessel did not leak too badly, she was expected to slosh off to war. Barges were in demand, since they could carry mortars and all manner of materiel. The shallow-draft "double-enders" were unique newcomers to the fleet. They were called "ninety-day gunboats" because of their rapid construction from green wood. Their engines were geared to enable them to reverse quickly and thus avoid turning in narrow rivers or channels. They were big, many of them, like the Sbamrock and Otsego, rated at almost 1,000 tons. And they were fast, capable of 12 or 13 knots. The Confederates possessed virtually nothing to match either their speed or agility. Uniquely tailored for a specific role in an unusual conflict, they were forerunners (except for their rapid production) of no future naval vessels. But they exemplified the imagination of their designers. Even as the United States Navy sought out fast ships to lend meaning to the executive proclamation, a swashbuckling fleet composed largely of British blockade-runners was hauling to sea, manned by river pilots, tugboat captains, grizzled ferryboat masters, and officers from the Royal Navy operating under assumed names. Great Britain was pragmatic in recognizing Washington's lack of an adequate watchdog fleet. She made no effort to discourage the growing squadrons of merchantmen that were materializing overnight to ply from Liverpool, Southampton, the Thames, and Belfast via the Bahamas, Bermuda, and Havana to the seceded states. If this was not bold enough, English shipyards heated up their spar-steaming kettles to build warships for the Confederacy. Business was business, even though Richmond's currency was backed by little more than cotton bales, tobacco, and turpentine. By 1862, although the United States Navy was increasing in size, blockade-running was approximating the frequency, if not the regularity, of the transatlantic steamship lines. Linked by a brotherhood of peril, the captains were a varied and daring lot. A few names stand out among the hundreds: Louis M. Coxetter, a tough one-time privateer with a price on his head; John Wilkinson, suave, rotund, formerly of the United States Navy, once imprisoned in Fort Warren in Boston Harbor; John Newland Maffitt, also resigned from the United States Navy, among the most innovative; and Augustus Charles Hobart-Hampden, surely the most colorful of the lot, late of Her Majesty's navy and holder of the Victoria Cross. "Lads, sharpen your swords!" was a quote attributed to Hobart-Hampden, who used several names to spare the navy embarrassment-Hewett, Ridge, Gulick, Roberts, and even Hobart-Pasha, during a subsequent stint with the Turkish navy. Improvisation was a sine qua non. The captains marshaled every ruse known, plus some hitherto unknown. They flashed false signals with lanterns, flew the Stars and Stripes or other national flags, changed nameplates, and even dipped colors to passing Federal men-o'-war. The latter often returned the honor. It is not surprising that the hunted proved more able to capture the world's imagination than did the hunters. Consider Coxetter's method of keeping crewmen at their posts in times of peril. Wrote James Morris Morgan, a fifteen-year-old midshipman aboard the 562-ton steamer-turned-blockade-runner Herald: "[Coxetter] was convinced that the great danger in running the blockade was in his own engine room, so he seated himself on the ladder leading down to it and politely informed the engineer-that if the engine stopped before he was clear of the [blockading] fleet, he, the engineer, would be a dead man. "As Coxetter held in his hand a Coles revolver, this sounded like no idle threat.... We safely bumped our way across the shallows, and plunging and tossing in the gale, this little cockleshell, whose rail was scarcely five feet above the sea level, bucked her way toward Bermuda." 'We now began to hold our own, and even to gain a little upon the chaser.... I saw the big'bone in the mouth' of our pertinacious friend, for she was near enough to us at one time for us to see distinctly the white curl of foam under her bows." Unfortunately, the burned cotton choked the flues. The Iroquois appeared to be gaining. Wilkinson ordered kegs of gold brought up to be distributed among the crew. A female passenger, Miss Lucy Gwin, offered to fill a purse and keep it on her person until the danger had passed. Twilight turned into darkness as the officer atop the paddle-wheel housings at last called out: 'We have lost sight of her!" "I remained on deck an hour," Wilkinson continued, "and then retired to my stateroom with a comfortable sense of security. We had fired so hard that the very planks on the bridge were almost scorching hot, and my feet were nearly blistered. "I put them out of the window to cool, after taking off slippers and socks. While in this position, Miss Lucy came on the bridge in company with her father. Tapping my foot with her hand, she said, 'ah, captain, I see we are all safe, and I congratulate you!" The experiences of Coxetter and Wilkinson were familiar ones to blockade-runners. Theirs was a defensive role, often frustrating. For the "hounds," the chasers, it was a different "game" entirely, even though they knew blockade-runners could never fight back, lest their captains be tried as privateers. Among the blockading fleet, only the methodical, competent Commander John J. Almuzi of the fast, 2,000-ton steamer USS Connecticut is much remembered, perhaps because he alone wrote memoirs of any consequence. The Connecticut set a record of four runners destroyed and four captured. As Almuzi recalled: "The blockade runners would always select dark nights to nm in and out, and certain stages of the moon; generally between the last and first quarters ... when it set early and rose late.... A tolerably high tide also entered into the calculation. "These blockade runners were all English steamers, and were painted lead color ... to prevent their being discovered at night, when running close in along the land. The fire and steam arrangements were for burning soft English coal, which always made black smoke, by which they could be discovered a long distance in the day. "On board the Connecticut, when the lookout at the masthead sang out, 'black smoke!' all was commotion. A chase once lasted 15 hours ... when the blockade runner was lost sight of. She had to throw overboard nearly all her cargo, which comprised English goods, as she was bound in. We passed through and by innumerable boxes during the day, some of which we perceived contained shoes." In foggy weather, Almuzi and his fellow pursuers often picked up the trail by such jetsam as cotton bales, which bobbed like buoys, boxes containing almost anything, half-empty barrels of turpentine, wine casks, and larger deck cargo such as wagon wheels or even entire wagons. The blockade-runners bought time for the South and prolonged the Union's effort to crush the rebellion. The battle of Shiloh, for example, would have been more one-sided had not nine hundred barrels of gunpowder been rushed into Wilmington, North Carolina, earmarked for that bloody contest in Tennessee. The effort-a transfusion-fell far short of a cure. The Anaconda Plan was choking the South. The course of the war and, indeed, the suicidal path of the Confederacy may have been embodied in a single incident from the blockade that took place on the last day of September 1864. Augustus Charles Hobart-Hampden, this time operating under the name of Ridge, was guiding his blockade-runner Condor toward Wilmington through stormy seas. He carried a most important passenger-Rose O'Neal Greenhow. In the North, she was considered notorious, and in the South, a heroine. With her entree to Washington society and officialdom, the well-to-do widow Greenhow had been able to learn about early Union strategies, most notably those preliminary to Bull Run. Mrs. Greenhow had passed advance details of troop movements to General Pierre Beauregard, one of President Davis's workhorse commanders. Apparently, the information contributed materially to the Union debacle in northeastern Virginia. Even terrible-tempered Secretary of War Edwin M. Stanton could not bring himself to do more than incarcerate the widow, first in her own house-"Fort Greenhow," her neighbors quipped-where she blithely continued to convey military information, and then in Old Capitol Prison. Finally, she was deported south. She tarried long enough only to pack her bags for London, where she traveled both to conduct Confederate business and to finish her memoirs. Her flirtation with belles-lettres reached print under the title My Imprisonment and the First Year of abolition Rule in Washington. Neither succinct nor objective, the book was largely a diatribe against the Union and an exhortation for the continuance of slavery. Like the ascetic, withdrawn Jefferson Davis, the widow Greenhow could not fathom why Washington was less than pleased with the South. Returning to Richmond aboard Hobart-Hampden's Condor, she bore undisclosed messages for President Davis and, around her neck, a small drawstring bag containing gold sovereigns. It was speculated that the bag contained some three hundred of the British coins, worth at least two thousand dollars. The sum may have come from either her publisher or some benefactor of the nearly depleted Confederate treasury. Condor had almost reached the New Inlet channel to the Cape Fear River when she was picked up by a Federal cruiser. In his desire to avoid a nearby wreck, Captain "Ridge" steered hard onto a shoal, cracking the keel. The normally cool and calculating Rose Greenhow panicked. She implored the commander to send her ashore in a small boat, shrilly asserting that she must not be captured. The daring Hobart-Hampden allowed emotion to prevail over common sense. He ordered a skiff made ready and gallantly assisted Mrs. Greenhow into it, along with the pilot and two strong rowers. Hobart-Hampden had grown up near the wild North Sea, and he should have known better. The sea lanes to Wilmington were lashed by the worst storms that the Gulf Stream, in its collision with Cape Hatteras, could conjure. The gale did not abate as the little craft bobbed off into the blackness. Half way to safety, it capsized in the huge combers. The men struggled to the beach, which was not many yards distant. Rose Greenhow, weighted by her gold coins, her flowing skirts, and her coat, sank. Her body washed ashore with other flotsam. A number of persons would take credit for the somber discovery. Something was wrong, though-the sovereigns and Mrs. Greenhow's dispatch case were missing. A soldier professing deep remorse did return some gold sovereigns, claiming to have stumbled across the body while on patrol and confessing that he could not resist pilfering the bag of gold. But many questions were left unanswered. Exactly how much money was returned? What became of it? Where was the dispatch case? Had a Federal agent reached the body first and rifled the case's contents? Why didn't the crew of the little boat make more of an effort to save their passenger? And what, if anything, was done with the soldier who stole and returned the coins? On October 1, Rose Greenhow's funeral was held in Wilmington. She was buried with full military honors in Oakdale Cemetery, her casket draped with the Stars and Bars, the emblem of the cause she so passionately served to her death. Somehow, the sacrificial act of the widow Greenhow, carried out during a brief moment toward the end of the long blockade, seems an epitaph for a Confederacy that was slowly strangling. The Union had recovered rapidly from its early lethargy. Within eight months of mobilization, morning colors were being sounded on 264 United States Navy vessels, ragtag or otherwise. A year later, the count was 427. By the last December of the war, that of 1864, 671 ships were on the Navy Department register. A virtual screen of vessels of all sizes, shapes, and types sealed off those Southern ports that had not already fallen to pressure from the sea or to the artillery of conquering armies, especially the forces of General Sherman. By then, the navy boasted the radical class of turreted flush-deckers spawned by the sunken Monitor, as well as heavy ironclads and swift gunboats. Big "steam sloops," mounting masts, became the last salute to ships of wood. To compensate for their fragility, most of these draped heavy chain armor over their sides. Nonetheless, their masts were like vestigial tails in the evolution of mammals. All of the new ships could overtake the blockade-runners, and usually did. The effects were severe. As a case in point, exports of cotton to England shrank from 816 million pounds to 6 million pounds in the first two years of the rebellion. The late author Robert Carse wrote in Blockade, published in 1958 by Rinehart & Co.: "There were in England more than 2 million people brought to starvation by the cotton shortage. The mills were closed tight. The millworkers had months ago spent the last of their savings. Then, the pictures had gone from the walls of the workers' homes, and the family trinkets were sold, and clothing, the chests of drawers, the rest of the furniture, the beds, the mattresses, the kitchen utensils. The families slept numb, wretched, on piles of straw. Girls of 14 and 15 went out on the streets.... Younger children died of malnutrition." The people of the South suffered greatly because of the disruption of the grain trade to Australia. Richmond experienced "bread riots" on Easter 1863. What was the toll on the runners? No one will ever know exactly. The South kept no records. Britain did not care to discuss her major role in the operations. The United States Navy, manifestly exaggerating, claimed that some 1,000 vessels were captured, destroyed, or disabled in attempting to pass the blockade. The navy said that 295 of these were steamers, the others "coasters," such as sailing vessels. Significant, nonetheless, was the fact that not one captain or officer lost his life on these ships, and very few passengers or crew. Prize courts placed a $24.5 million price tag on captured ships and their cargoes. Those destroyed were valued at approximately $7 million. The grave markers of a valiant attempt to break through to a hungry and beleaguered South are yet strewn along the Southeast coast and into the Gulf of Mexico-the rusted, barnacled fittings of such as the Condor, Little Lila, Will o' the Wisp, Sopbia, Georgiana, Nigbt Hawk, Stonewall Jackson, Ruby, Venus, Vesta, Ranger, Fanny and jenny, Mary Bowen, Lynx, Stormy Petrel ... Scores, perhaps hundreds. The war at sea was demanding, real, and frightening, even though casualties were dwarfed by those in the great land battles. This backward look at a fiery period of our nation's history focuses upon the people of North and South and their many acts of daring and valor as they fought upon the seas and lesser waters. It is their story, told largely in their own words, always against the backdrop of the blockade.